Opening times are generally between 7-8pm and closing time varies between 11pm and 1am. All opening and closing times subject to change without notice. Please see our Calendar link for general open dates. Do you recommend any other haunted websites? Yes, both male and female restrooms are available at each haunted attraction. What time does the line start forming? ENTRANCE LINES often begin forming 30 minutes before our scheduled opening time; however they are often earlier on Fridays and Saturdays in October. BUY YOUR TICKETS ONLINE AND SKIP THE TICKET AND ENTRANCE LINES by purchasing a LINE PASS ticket. Your wait in line can vary nightly. Generally we have shorter lines on Thursdays and Sundays. BUY YOUR TICKETS ONLINE AND SKIP THE TICKET AND ENTRANCE LINES by purchasing a LINE PASS ticket. If I get there at 11pm and I bought a combo ticket for two haunted attractions, will I get a chance to go through both attractions? We make every effort to allow our guests with combo tickets to see both attractions on the same night, but in the event you miss the second attraction your unused ticket(s) may be used on another valid night during the same season. BUY YOUR TICKETS ONLINE AND SKIP THE TICKET AND ENTRANCE LINES by purchasing a LINE PASS ticket. Are there any motels/hotels that offer special rates? Yes, please visit our hotel section. Once we've used our ticket can we go through the same attraction again with the same ticket? No, your ticket grants you a one time admission to the attraction. We do not offer refunds or discounts for lost tickets. Please check our Facebook page at https://www.facebook.com/kcbeastedge/ for current discounts and promos. When can I use a coupon? We have several types of coupons. Please read them carefully to see what days they can be used. NOTE: No coupons are accepted Saturdays in October, or on Halloween. You may join our Spooks and Specials Mailing List to receive discounts and special offers via email. You may also visit participating Hen House stores to receive a $5.00 coupon for any single ticket to the Edge of Hell. Do you offer discounted rates for children? Sorry, we do not offer special prices for children. Children under 12 must be accompanied by an adult. How do I avoid waiting in line? You may purchase a VIP PASS which allows you to avoid the ticketing line at the door. I just bought my ticket online…do I still have to wait in line when I get to the Haunted House? We offer two types of tickets online: a VIP PASS which allows you to skip the ticketing line and the regular pre-purchased ticket line, or the regular online ticket which allows you to skip the ticketing line at the door. Yes, for groups of 25 or more. Group ticket sales must be arranged in advance and CANNOT be purchased at the door. Please call (816) 842-4280 and ask for group sales. Note: Groups will be divided into 4-6 people at a time when entering any of the haunted attractions. Yes, we offer reservations for groups of 25 or more people. Please call (816) 842-4280 and ask for group sales. Note: Groups will be divided into 4-6 people at a time when entering any of the haunted attractions. What are the prices for the different haunted attractions? Please visit our Tickets page for this years pricing. Can I wear sandals or flip flops? Enter at your own risk. We have uneven floors in some areas and the scares are very intense and sandals or flip flops are NOT recommended. We are not responsible for lost sandals, flip flops or other personal items. Yes, there are, please be respectful. Can we touch the actors or props? Contact with our actors is prohibited. You will be asked to leave without a refund if you are caught touching our actors or props. Do you have strobe lights, loud noises, or fog? Yes, we do have strobe lights, very loud noises and fog machines. You enter at your own risk. If you feel the experience too intense there are emergency exits throughout the attraction. No refunds will be given. Which house is your favorite or which house is the scariest? 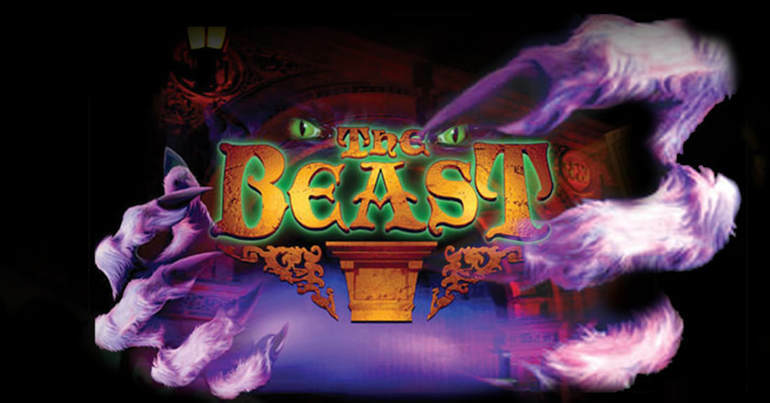 The Beast Haunted House is visually amazing and the “open floor” format means that the monsters can come at you from any direction which always keeps you jumping. IF you don’t get lost in the fog, roaming about the werewolf forest, or stuck in the maze your journey will end with an exhilarating 4 story straight chute slide. The Edge of Hell Haunted House is a converted five story warehouse that offers a quarter mile walk-thru of sensory stimulation with an old fashioned, high impact scare that is never ending high energy and right in your face. As you ascend into heaven to confront your sins, breathing a sign of relief, you are sent down a five story spiral slide straight into the awaiting arms of the Devil himself. Macabre Cinema Haunted House, like the Beast Haunted House is an “open floor” format as you wander through our haunted 1930’s movie theater and lets you LIVE the fear and action of several classic and contemporary horror movies. If I get too scared to make it through the haunted house, can I get a refund? No. You paid us to scare you. If you get scared in the line or in the first few rooms and want to leave, we've done what you paid us to do very quickly. Be happy with prompt service! Can I get out if I want to? Yes, up to 100 people a night are too scared to make it through each house and are let out by our staff. The lines are too long! When is the best arrival time to avoid a long line? We suggest you arrive early. Many people complain about long lines but everyone always shows up around 9pm. Our suggestion is for you to come and buy your ticket when we open so you are one of the first in line. Our busiest nights are always on Fridays and Saturdays and the closer to Halloween it gets the busier we are. BUY YOUR TICKETS ONLINE AND SKIP THE TICKET AND ENTRANCE LINES by purchasing a VIP LINE PASS ticket. Each season we make changes to various scenes and scares throughout the attractions! What can't we bring with us inside your haunted houses? No pets! No weapons! No alcoholic beverages! No cameras! No smoking! No laser pointers or flashlights! No food or beverages! This includes but is not limited to: mace, firearms, knifes, and martial arts weapons. We are not responsible for lost cell phones or other personal items. NO photography or video of any sort is allowed after you enter the attraction. In addition, all cell phones must remain in the off position once you enter the attraction. Guests will be removed if disturbing others’ experience with cell phone lights. We are not responsible for lost cell phones. Smoking is allowed outside. Smoking is NOT allowed indoors. Do you serve alcoholic beverages?. All patrons assume ALL RISK and DANGER incidental to FULL MOON PRODUCTIONS, BEFORE, DURING or AFTER the attraction. NOT RECOMMENDED for pregnant women; people with high blood pressure, back, neck, health, hearing or heart ailments: or phobias, including SNAKES. NO PACEMAKERS! NO CHILDREN UNDER 12 ADMITTED WITHOUT A GUARDIAN. The floors are uneven; the slides are fast and dark; you WILL be enveloped by creeping fog and vapors. WATCH YOUR STEP!! YOU WILL BE VIDEOTAPED AND COULD BE BROADCAST ON OUR WEBSITES WITH NO COMPENSATION. By entering ANY FULL MOON PRODUCTIONS, INC. haunted attraction or any of it’s affiliates, you waive any injury or talent claims whatsoever and accept these terms and conditions. Specifically you claim no copyright interest in your image if used as part of any websites, any video images, or any promotional materials for Full Moon Productions, Inc. or others. You hereby RELEASE ALL BROADCAST & TALENT RIGHTS. Please see our Waiver of Liability page for more information. No Refunds!! Can we be thrown out or denied entry for any reason? Yes, for the safety of all of our guests we do not allow foul language, pushing, vulgar behavior, weapons of any kind, drugs or alcohol, etc. If our security team determines you are under the influence of and drugs or alcohol you may also be denied entry or removed from the premises. We do not offer refunds if you are thrown out or denied entry. Do your attractions have security? Yes, we use Kansas City Police Officers to supplement our internal security team. Rarely do we have a problem that requires security but we have them just in case. Officers are assigned to each haunted attraction as well as some to patrol the area. Furthermore, we utilize Kansas City Firefighters at the attractions every night we are open. Sorry, because our attractions cover multiple floors we are not able to accommodate wheelchairs. Can I go through the house if I'm pregnant? The houses are dark with uneven floors and two attractions have slides. Our Haunted Attractions are NOT RECOMMENDED for pregnant women; people with high blood pressure, back, neck, health, hearing or heart ailments: or phobias, including SNAKES. NO PACEMAKERS! Are your attractions open if it rains? Yes! Our haunted attractions are inside. The ticketing line to enter the attractions are outside. Please be prepared in case of bad weather conditions and get your VIP PASS- SKIP THE LINE tickets online and SKIP THE LINE! Can my friends and I wear our Halloween costumes while inside the haunted attractions? No. For safety reasons, guests are not permitted to wear costumes or masks. If you are wearing facial makeup you will be asked to wipe it off. Is it a maze? Is it dark? The attractions themselves are not mazes, but some of the attractions have mazes inside them and it’s possible that you can get very confused. And yes it is dark! No, guests walk through all the attractions. Children under 12 must be accompanied by an adult. Generally we think the youngest age should be around 11 or 12, but it really depends on your child. If you have a child that can watch scary movies and isn’t frightened, then they are probably OK to go through. However, if the child is easily startled or frightened by scary images, you may want to wait until they are a little bit older. There are many emergency exits throughout each attraction in case anyone gets too scared to continue. No refunds will be provided. ENTER AT YOUR OWN RISK! You may be touched and it’s possible you may brush up against their costumes, props, or some of the sets and decor. You may also be grabbed by a member of your own group or even a complete stranger who is too terrified to continue without your help. How long does it take to go through the haunted houses? The length of time varies for haunted houses, depending on skill to find your way out and not get lost. On average, the Beast Haunted House takes approximately 45 minutes, Edge of Hell Haunted House takes approximately 30 minutes and Macabre Cinema Haunted House takes approximately 45 minutes to complete.